In the iconic words of one Juno MacGuff, "Whoa, dream big!" With the knowledge that Ben Affleck won't reprise his role as the Caped Crusader for director Matt Reeves' The Batman, an actor from Man of Steel has tossed his name into the running for the gig. DC Extended Universe enthusiasts, Batman comic fans, and everyone in the superhero-loving section of Hollywood have been buzzing about which stars might step up and don the cap and cowl in Affleck's stead — with the most recent name to crop up in association with The Batman being Robert Pattinson, the Brit who broke into the mainstream by glittering in the sun and brooding in the shadows as vampire Edward Cullen in the Twilight film franchise and who has since gone on to prove himself a bonafide dramatic actor. The internet cracked in half upon hearing the rumors of Pattinson potentially playing Batman, with some expressing intrigue over the possibility and others denouncing the actor as a poor choice to portray the famed vigilante. One such member of the anti-Pattinson-as-Batman camp shared their thoughts about who should really play Batman in Reeves' forthcoming feature: Chris Meloni, who appeared as Colonel Nathan Hardy in 2013's Man of Steel. "NO, NO, and a million times NO, dude! Robert Pattinson would make a terrible Batman. I think @Chris_Meloni would make an excellent Batman/Bruce Wayne," user Emily Diaz posted to Twitter in early February, responding to a news article covering the reports of Pattinson being eyed to lead The Batman. Meloni, who is most recognizable from his lead role as NYPD Detective Elliot Stabler on Law & Order: Special Victims Unit, quickly caught wind of the emphatic fan's desire to see him grab the superhero torch from Affleck and assume the Batman mantle. The actor took to his own Twitter page to reveal that he would love to play Batman, making it clear that he's ready to answer the call if DC Comics reaches out. "Yo @DCComics this is what the kids call, 'going VIRAL'!" wrote Meloni, who retweeted Diaz's post. "Pull the trigger. I'm ready. I'm….BATMAN." Meloni's enthusiasm warms the heart and provides a serendipitous sense of comfort to those whose fingers have been on the pulse of The Batman since its inception. Affleck's wishy-washy, will-I-won't-I attitude toward the project and his constant jumping in and backing out of the starring spot and the director's seat left many fans with mental whiplash as they tried to stay up to date on his involvement. His contradictory statements — at one point saying that "Batman is the coolest f***ing part in any universe" and that he would "be a f***ing ape on the ground for Matt Reeves," and later doing an about-face in mentioning that he was only "contemplating" doing The Batman and was hoping to "find a graceful and cool way to segue out of it" — were just as disheartening. We don't feel it's a stretch to say that DCEU fans would rather have someone like Meloni, who genuinely wants to be Batman in Reeves' feature, than see Bat-fleck on the big screen another time after the actor has been so back-and-forth about his commitment to the project. 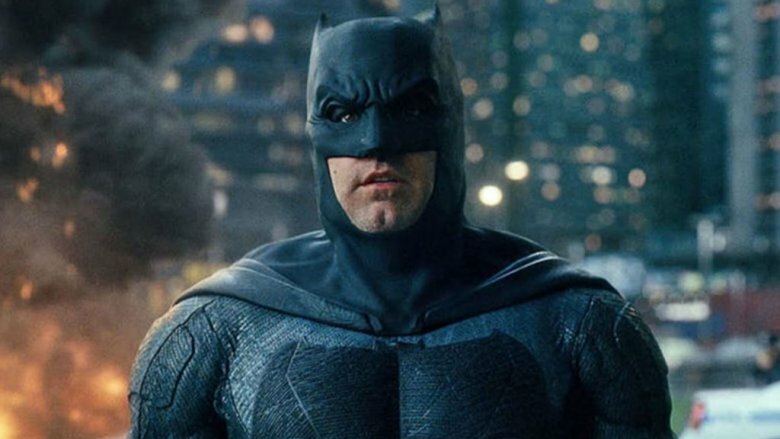 There are plenty of stars who could fill Affleck's shoes for The Batman — like English actor Jack O'Connell, Stranger Things star Dacre Montgomery, Call Me By Your Name actor Armie Hammer, Spider-Man: Far From Home star Jake Gyllenhaal, singer-songwriter-actor Nick Jonas, The Flash actor Robbie Amell, and even Mad Men alum Jon Hamm, who was once said to be "gunning hard" for the gig. He may not be the top choice for the role, but Meloni as Batman is a fun thing to think about. And he has enough experience in the comic book world and across the drama genre to do the part justice. Meloni's work in Sin City: A Dame to Kill For (based on Frank Miller's neo-noir crime comic series Sin City) and his performance as Nick Sax on the SYFY series Happy! (based on the comic mini-series by writer Grant Morrison and artist Darick Robertson) give him a little extra edge over his could-be competition. Unfortunately, there are a few factors that cut down Meloni's chances of playing Batman. For starters, his 57 years of age falls far outside the late-20s-to-early-30s range that Warner Bros. is reportedly digging through. Additionally, Meloni is slated to voice Gotham City Commissioner James Gordon in the upcoming animated Harley Quinn series, which might complicate things. Granted, he did lend his voice to Hal Jordan in the DC Comics animated movie Green Lantern: First Flight, so perhaps Warner Bros. and DC are fine double-dipping between animated projects and live-action films. However, his role as Colonel Hardy in Man of Still might pose an issue. Current information about The Batman is still too thin to state one way or another whether The Batman exists as part of the DCEU. If it isn't and acts as a standalone separate from the shared series, then Meloni's Man of Steel performance may not be a problem at all. If The Batman is connected to the DCEU, the actor's appearance in the 2013 flick could be cause for concern. To that effect, though, so would Affleck's performances in every DCEU entry he's been in, since a different actor is set to take his spot. In all, it's unlikely that Meloni will play Batman in Reeves' film, as the director is said to be scouting for a younger actor to lead as a fresh-faced Caped Crusader in his earlier days defending Gotham from danger. Meloni may not top-line The Batman as he so hopes, but that doesn't mean he can't have a small part in it, just as he had a supporting role in Man of Steel. Maybe he'll pop up as another civilian? Make a cameo as a villain in a short sequence? Never say never. The Batman is due out on June 25, 2021.